The Prophet Isaiah says, "Beautiful are the feet of them that bring good tidings of good." And what could there be so sweet to learn as that God has saved the world by the mediation of the Son, in that He was made like unto us? For it is written, "that there is one God, and one Mediator of God and men, the man Jesus Christ, Who gave Himself a ransom for us." For of His own accord He descended to our poverty, that He might make us rich by our gaining what is His. Behold Him therefore as one in our estate presented unto the Father, and obedient to the shadows of the law, offering sacrifice moreover according to what was customary, true though it be that these things were done by the instrumentality of His mother according to the flesh. Was He then unrecognized by all at Jerusalem, and known to none dwelling there? How could this be the case? For God the Father had before proclaimed by the holy prophets, that in due season the Son would be manifested to save them that were lost, and to give light to them that were in darkness. By one too of the holy prophets He said, "My righteousness approaches quickly, and My mercy to be revealed, and My salvation shall burn as a torch." But the mercy and righteousness is Christ, for through Him have we obtained mercy and righteousness, having washed away our filthy vileness by faith that is in Him. And that which a torch going before them is to those in night and darkness, this has Christ become for those who are in mental gloom and darkness, implanting in them the divine light. For this reason also the blessed prophets prayed to be made partakers of His great grace, saying, "Show us Your mercy, O Lord, and grant us Your salvation." 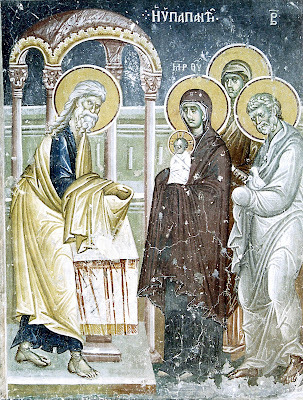 Christ therefore was carried into the temple, being yet a little child at the breast, and the blessed Symeon being endowed with the grace of prophecy, takes Him in his arms, and filled with the highest joy, blessed God, and said: "Lord, now let Your servant depart in peace according to Your word, for mine eyes have seen Your salvation, which You have prepared before the face of all the nations, a light for revelation unto the gentiles, and a glory of Your people Israel." For the mystery of Christ had been prepared even before the very foundation of the world, but was manifested in the last ages of time, and became a light for those who in darkness and error had fallen under the devil's hand. These were they "who serve the creation instead of the Creator," worshiping moreover the dragon, the author of evil, and the impure throng of devils, to whom they attach the honor due unto God. Yet were they called by God the Father to the acknowledgment of the Son Who is the true light. Of them in turn He said by the voice of Isaiah, "I will make signs unto them, and receive them, because I will ransom them, and they shall be multiplied, as they were many. And I will sow them among the nations, and they who are afar off shall remember Me." For very many were they that were astray, but were called through Christ. And again they are many as they were before; for they have been received and ransomed, having obtained as the token of peace from God the Father, the adoption into His family and the grace that is by faith in Jesus Christ. And the divine disciples were sown widely among the nations. And what is the consequence? Those who at disposition were far from God, have been made near. To whom also the divine Paul sends an epistle, saying, "Now you who some time were afar off have been made near in the blood of Christ." And having been brought near, they make Christ their glory, for again, God the Father has said of them, "And I will strengthen them in the Lord their God, and in His Name shall they glory, sats the Lord." This also the blessed Psalmist teaches, speaking as it were unto Christ the Savior of all, and saying, "Lord, they shall walk in the light of Your countenance, and in Your Name shall they exult all the day, and in Your righteousness shall they be exalted. For You are the glory of their strength." And we shall find also the prophet Jeremiah calling out unto God, "Lord, my strength and my help, and my refuge in the day of my evils, to You shall the heathen come from the end of the earth, and say, Our fathers took unto themselves false idols, in which there is no help." Christ therefore became the light of the gentiles for revelation, but also for the glory of Israel. For even granting that some of them proved insolent, and disobedient, and with minds void of understanding, yet is there a remnant saved, and admitted unto glory through Christ. And the first-fruits of these were the divine disciples, the brightness of whose renown lightens the whole world. And in another sense Christ is the glory of Israel, for He came of them according to the flesh, though He be "God over all, and blessed forevermore, Amen." And Symeon blessed also the holy Virgin as the handmaid of the divine counsel, and the instrument of the birth that submitted not itself to the laws of human nature. For being a virgin she brought forth, and that not by man, but by the power of the Holy Spirit having come upon her. And what does the prophet Symeon say of Christ? "Behold this child is set for the fall and rising again of many in Israel, and for a sign that shall be spoken against it." For the Emmanuel is set by God the Father for the foundations of Sion, "being a stone elect, chief of the corner, and honorable." Those then that trusted in Him were not ashamed: but those who were unbelieving and ignorant, and unable to perceive the mystery regarding Him, fell, and were broken in pieces. For God the Father again has somewhere said, "Behold I lay in Sion a stone of stumbling and a rock of offense, and He that believes on It shall not be ashamed; but on whomsoever It shall fall, It will winnow him." But the prophet bade the Israelites be secure, saying, "Sanctify the Lord Himself, and He shall be your fear; and if you trust upon Him, He shall be your sanctification, nor shall you strike against Him as on a stone of stumbling, and a rock of offense." Because Israel did not sanctify the Emmanuel Who is Lord and God, nor was willing to trust in Him, having stumbled as upon a stone because of unbelief, it was broken in pieces and fell. But many rose again, those, namely, who embraced faith in Him. For they changed from a legal to a spiritual service, from having in them a slavish spirit, they were enriched with that Spirit which makes free, even the Holy Spirit. They were made partakers of the divine nature, they were counted worthy of the adoption of sons, and live in hope of gaining the city that is above, even the citizenship of the kingdom of heaven. And by the sign that is spoken against, he means the honorable Cross, for as the most wise Paul writes, "to the Jews it is a stumbling-block, and foolishness to the heathen." And again, "To them that are perishing it is foolishness, but to us who are being saved, it is the power of God unto salvation." The sign therefore is spoken against, if to those that perish it seem to be folly; while to those who acknowledge its power it is salvation and life. The very wise Evangelist therefore for our benefit teaches us all things whatsoever the Son, when He was made flesh, and consented to bear our poverty, endured for our sakes and on our behalf, that so we may glorify Him as our Redeemer, as our Lord, as our Savior, and our God, by Whom and with Whom to God the Father and the Holy Spirit be the glory and the power forever and ever. Amen.